It’s July and that means we’re in the thick of grilling season. With all those hamburgers and hot dogs, it’s easy to feel a little bit left out if you’re a vegetarian, and if you live in an apartment or a place without a backyard, you might just shrug your shoulders and decide that grilling just isn’t for you. That’s quitter talk! Don’t give up on grilling! First, let’s go over your grilling options. Gas and propane grills are for serious grilling. They range in price from a few hundred dollars to a few thousand. If I were Vicki Gunvalson and I had an awesome outdoor kitchen and a pool with a grotto, I would invest in an expensive grill like the one pictured here, but I am not Vicki Gunvalson and since we don’t grill all that often, we’ve decided a gas grill isn’t worth the investment for us. Pros: Temperature control gives you more reliability and predictability in cooking. This is nice! Many gas grills even have temperature zones so you can cook a variety of foods at the same time and cleanup is easier than with charcoal grills. Cons: Although there are inexpensive gas grills, they’re still the priciest grilling option. You also need outdoor space — if you live in an apartment, a gas grill is probably out of the question for you. If the whole cooking outdoors thing appeals to you, but you don’t want to commit to a gas grill, then a charcoal grill might be perfect for you. There are some more expensive options, but you can get a small charcoal grill for as little as $30 and it works just fine for a small family. Pros: Some people say charcoal grills produce better tasting food. Charcoal grills are cheaper and more portable than their gas counterparts. Small charcoal grills can be brought to picnics or on vacation. Cons: Coal isn’t exactly environmentally friendly and both lighting the coals and cleaning up afterwards can be a pain. Without precise temperature controls, cooking is a little more unpredictable than with a gas grill. While I have a small charcoal grill, I swear by my Cuisinart Griddler and that’s what I use most for grilling. No, that’s not very outdoorsy of me, but it’s no muss, no fuss, and easy cleanup. If you don’t have outdoor space and you don’t anticipate grilling very often, an indoor grill is a good investment. Pros: Many indoor grills have a variety of functions, so you can use them as griddles, waffle makers, and more. They’re great for cooks who don’t have outdoor space and they can be used year-round. Indoor grills are portable and they don’t take up much space. Cons: Indoor grills are lacking when it comes to that smoky grilled flavor — that’s a pretty big con. Many don’t heat up as quickly or as hot as charcoal or gas grills and the small size that makes them portable can be a negative too — if you’re making a lot of food, you’ll have to cook in batches. Grill pans! If you are a commitment-phobe, a grill pan is for you. They take up virtually no space, need very little cleanup, and they’re pretty inexpensive, depending on the kind you buy — while cast iron grill pans are more expensive, most will last for decades. Pros: Like indoor grills, they’re portable, take up very little space, and can be used year-round. Cons: Most of the cons for grill pans are the same as with indoor grills — while you can get that nice searing from the grill, the smoky flavor is missing. Grill pans are the smallest of all the grill options, so you’ll very likely have to make your food in batches rather than cooking it all at once. Now let’s get to the good stuff: FOOD. 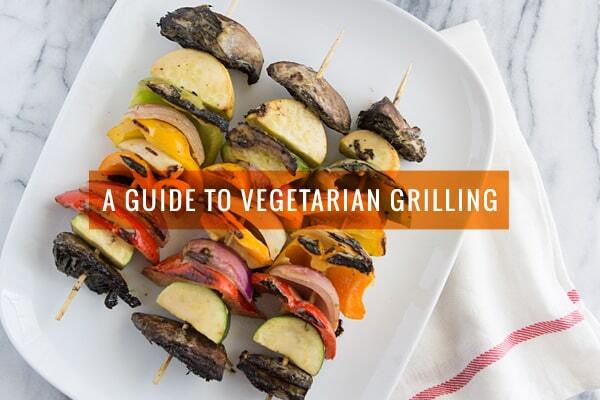 In general, anything that’s not meat will grill much faster than steaks and burgers, so if you’re used to cooking meat on a grill, be aware that many vegetarian grilling staples will be done after only a few minutes of cooking when you’re using a charcoal or gas grill. Because these foods don’t have fat in them like meat does, you’ll need to make sure your grill is well-oiled with a high smoke point oil to prevent sticking. One word: kabobs! Cut your favorite summer vegetables into uniform sizes, thread them through a skewer, marinate them in your favorite sauce, and grill them up until they’re perfectly seared. Zucchini and other varieties of summer squash stand up really well to grilling, as do peppers, eggplant, onions, cherry tomatoes, cauliflower, corn, and even potatoes. If you’re not doing skewers, a grill basket or foil packets work well for smaller veggies, while zucchini and eggplant can be cut lengthwise. Because it’s so soft, tofu can be tricky on the grill — the secret is to start with extra-firm tofu, press all the liquid out, and remember that your grill needs to be well-oiled. Tempeh is a little more forgiving when it comes to grilling. Make sure you cut it into big slabs so it doesn’t crumble through the slats! Both tempeh and tofu make tasty additions to veggie kabobs. The grilled portabella is a vegetarian classic with good reason — it just tastes good. And it’s easy! My very basic, fool-proof recipe is to whisk together equal parts balsamic vinegar and olive oil (not extra-virgin!) with a pinch of salt and a few twists of freshly cracked black pepper. If you happen to have rosemary in your garden, mince a little bit of that to add in too. Marinate your mushrooms in this mixture for an hour or two, then throw them on the grill. If you haven’t had grilled pineapple before, you need to carpe diem and get on that today. Grilled fruit makes a simple summer dessert — the sugars in the fruit caramelize, making their flavors deeper and sweeter. In additional to pineapple, stone fruits like peaches and nectarines, mangoes, and even watermelon do well on the grill. Yes, you can grill greens! And depending on what type of grill you’re using, many need less than a minute on the grill and they’re done. Heads of romaine lettuce can be grilled up for salad and kale leaves on the grill get crispy just like kale chips, but with the added bonus of that smoky grilled flavor. Like tofu, polenta can be tough to grill — if you’re using homemade polenta, you’ll want to make sure it’s cut into big slabs. The store-bought kind tends to be a little bit sturdier, but no matter which kind you use, be sure to oil your grill really well before grilling polenta so it doesn’t stick. Grilled polenta can be added to salads or piled high with fresh summer vegetables. Raw pizza dough can be placed directly on the grill instead of being baked in the oven — Kare has a grilled pizza dough recipe and tutorial over on Kitchen Treaty that lays out all the details. And if you don’t want to mess with raw dough, you can use a pre-made crust too! Naan, pitas, and other flatbreads are also great on the grill, but keep an eye on them — you want to get them nicely seared, not burnt. Well yeah, I couldn’t leave out the veggie burgers, could I? I tend to prefer store-bought frozen veggie burgers for grilling — they seem to stand up to grilling a lot better than homemade veggie burgers. (I’ve had many “oh no, the veggie burgers are crumbling through the grates!” grilling disasters.) Hilary’s Eat Well and Sunshine Burgers are two of my favorite brands because they’re made with real food ingredients. If you do want to make homemade veggie burgers on the grill, I’d suggest looking for a recipe specifically made for grilling or place the burgers on a sheet of foil and then put them on the grill so they won’t fall through the grates; another option is to bake the patties in the oven until they’re solid, and then finish them on the grill. Great post! I am a huge fan of vegetables on the grill! Love this guide! 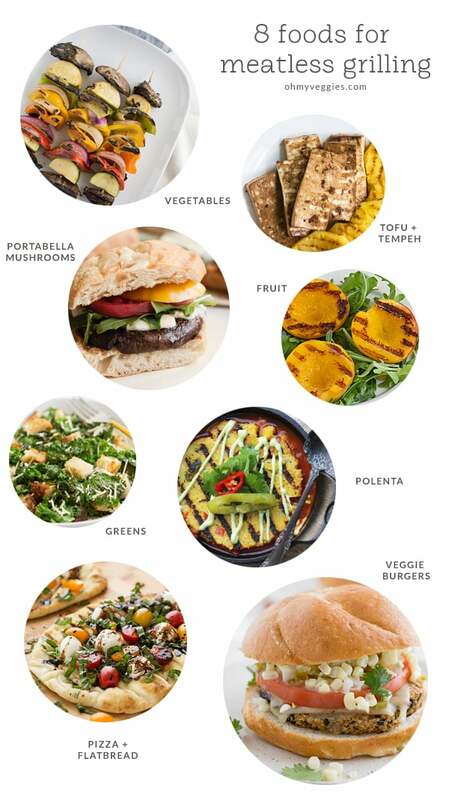 Next of my list is that cauliflower hummus burger…two things currently in my fridge! I saw tempeh at my local health store so got to try that out. People seem to either love or hate tempeh. 🙂 It’s my favorite substitute for ground beef though – you can crumble it up and I swear you can’t even tell the difference in tacos and sloppy joes! What we need in the US is halloumi cheese, which my sister in England gets easily. It is truly a grillable cheese. Marinate/season it, put it in kebobs, it doesn’t melt but is delicious. My local Whole Foods had it a bit (on the top shelf) priced crazy (you could have bought great wild salmon for less) but doesn’t have it anymore. How funny, any apartment I’ve lived in has only ever allowed gas grills on balconies, not charcoal. Less smoky I think. I second the above comment about halloumi. I’ve found it in Middle Eastern or Greek delis here in Canada. I grill vegetarian all the time! Extra firm tofu lightly basted in vegetable oil and seasoned, grilled to a crunchy outside. Sweet potato slabs tossed in oil, ginger and chili flakes, zucchini with garlic powder and paprika. All of it is so yummy. I don’t have a grill could I use my waffle iron instead for grilling veggies? I’m not sure how that would work, though I’ve heard that tofu cooks up great in a waffle iron. Most of the advice in this post applies to cooking with a grill. If you’re not ready to invest in one you could always start with a small indoor electric or stove top grill. I barbecue veggie lover constantly! Additional firm tofu daintily treated in vegetable oil and prepared, barbecued to a crunchy outside. Sweet potato chunks hurled in oil, ginger and bean stew chips, zucchini with garlic powder and paprika. Every last bit of it is so yummy.